Paedophryne amauensis is a species o frog frae Papua New Guinea discovered in August 2009 an formally described in Januar 2012. At 7.7 mm (0.30 in) in length, it is the warld's smawest kent vertebrate. The newly describit frog species wis leetit in the Top 10 New Species 2013 bi the Internaitional Institute for Species Exploration for discoveries made durin 2012. The leet wis annoonced on 22 Mey 2013. ↑ 1.0 1.1 Black, Richard (11 January 2012). "World's smallest frog discovered". BBC News. Retrieved 12 January 2012. ↑ 2.0 2.1 2.2 Rittmeyer, Eric N.; Allison, Allen; Gründler, Michael C.; Thompson, Derrick K.; Austin, Christopher C. (2012). "Ecological guild evolution and the discovery of the world's smallest vertebrate". PLoS ONE. Public Library of Science. 7 (1): e29797. doi:10.1371/journal.pone.0029797. PMC 3256195  . PMID 22253785. Retrieved 11 January 2012. 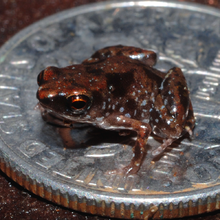 ↑ "World's tiniest frogs found in Papua New Guinea". The Australian. 12 January 2012. Retrieved 11 January 2012. ↑ Newswise (22 May 2013). "Scientists Announce Top 10 New Species". Arizona State University College of Liberal Arts and Sciences. Newswise, Inc. Retrieved 2013-05-23. ↑ Arizona State University College of Liberal Arts and Sciences (22 May 2013). "Top 10 new species of 2012". ScienceDaily. ScienceDaily, LLC. Retrieved 2013-05-23. ↑ Varma S (23 May 2013). "Amazing top 10 new species include glowing cockroach, tiniest vertebrate and new monkey". The Times of India. Bennett, Coleman & Co. Ltd. Retrieved 2013-05-24.